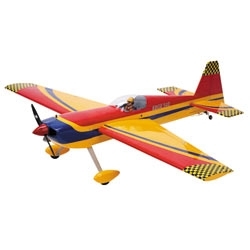 Edge 540's are among RC modeling's most popular aerobatic airplanes. The Edge 540 46 ARF is a scale aerobatic performer in the ever-popular .46-size marketplace. If you're a glow pilot, you'll appreciate the variety of engines you can use. And if you're an electric-minded flier, you can convert your Edge 540 to fly with you favorite motor. The lightweight, laser-cut balsa and plywood design offers you better aerobatic performance, while the genuine Hangar 9® UltraCote® polishes off the attractive design.